Pinnacle Studio is one of the longest serving video editing suites for non-professionals. It's also one of our favourites, as it's easy to get to grips with, yet boasts features that the experienced user will find useful. This latest version adds a host of new and usable features. The suite has clearly been designed with the first-time user in mind, as you'll find a host of tutorials to help get you up and running. The interface follows the same styling as the other suites here, with a timeline along the bottom and controls in the top-left corner. When clicked, each opens to give you a wider range of tools. Getting the most from the software is easy, and navigation is well thought out. However, while you won't want to run Pinnacle Studio on a budget laptop, we found that it performed well via a 2GHz dual-core processor and 2048MB of RAM. As with most video editing suites, you'll find there are a number of price options for Pinnacle Studio. We've looked at the top option, but you can also choose the feature-stripped Studio Plus (£70 inc. VAT), or entry-level Studio (£40 inc. VAT) software. However, you will find a corresponding drop in functions, with Studio lacking HD support or picture-in-picture and chroma-key effects. This Ultimate version comes with a host of extras, befitting the name and the extra cost, and includes proDAD VitaScene, which adds a range of lighting effects and colour correction tools, while Boris Graffiti is used for creating 3D animations. Finally, Magic Bullet Looks can adjust the colour, tone and focus of your movies to give them a far more professional finish. Over 100 preset designs also speed up title creation. 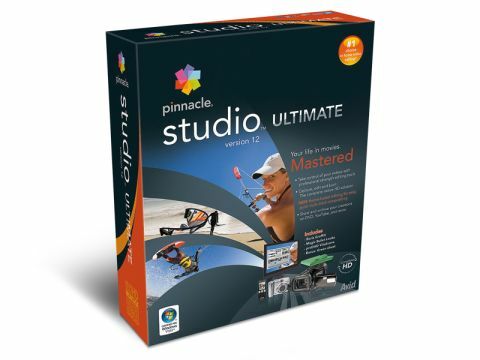 For our money, Pinnacle Studio 12 Ultimate is the best home video editing software around. This is a fully featured suite that represents a great entry point to video editing, but at the same time has enough features to offer seasoned users a healthy raft of tools.